The winners of the last two Premier League campaigns are set to square off in the FA Cup quarter-finals, with both sides hoping to make a pretty disappointing season at least a little bit better. 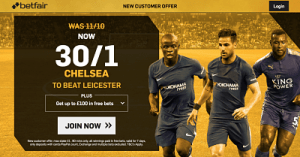 Despite suffering a 3-0 loss to Barcelona in midweek, Chelsea are rightly considered favourites to win at King Power Stadium, and you will be glad to hear that new Betfair customers signing up through this link with promo code ZFBDNC are quoted a special 30/1 price on away win. New Customers can get Chelsea at an enhanced 30/1 to beat Leicester. Max Stake £1. Winnings paid in free bets. Full T&Cs Apply. 18+|Gamble Aware.